You can't have escaped the news lately about microplastics and their effect on the planet. 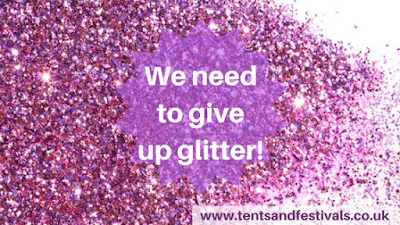 First we were told about microbeads in cosmetics, now it is the turn of glitter to be in the spotlight. First a school was reported as having banned glitter and while, like many people, my initial thought was 'what on earth?' I realise now that glitter is small but deadly. In fact as far back as last summer I had been thinking about glitter. While it hadn't really occurred to me that all glitter use was bad, I was aware that flinging glitter (tiny non-biodegradable pieces of plastic) into the environment was bad, so I didn't hold with the ridiculous idea of 'magic reindeer food' at Christmas time, and I had started thinking that festival body glitter would have to go.